Brian Johnson didn’t feel helpless on the mound very often in high school. But when it happened, it was always in the same situation. During a long at-bat in which the opposing hitter fouled off pitch after pitch, Johnson grew progressively more nervous. He was only a two-pitch pitcher. If the hitter had the timing of his fastball and curveball, there wasn’t another option to throw. “I just threw it and hoped to God I threw a good pitch,” Johnson said, shaking his head. If Johnson, whose dad played football at Florida State, wanted to continue as a starting pitcher, throwing two pitches for strikes at the SEC level wouldn’t get the job done. He needed to find a third. That was the first thing he started to work on during individual workouts in August. Head coach Kevin O’Sullivan immediately started to get the 6-3, 225-pound left-hander comfortable with the grip of a changeup. In six months of work in the bullpen and against hitters in scrimmages, the changeup has become Johnson’s go-to off-speed pitch. It was the curveball in high school that he used to keep hitters from sitting on his low-90s fastball. In the past six months, the changeup has become the off-speed pitch he uses the most. Most pitchers can’t learn a quality off-speed pitch in as little time as Johnson needed. It just came natural to him. It’s a product of being blessed with skills that most people don’t have. They’re the same skills that allowed him to hit .551 (27-of-49). He mixed in nine home runs, one every 5.4 at-bats, and 21 RBI. Drop Johnson on any part of the field, and it won’t take him long to find his bearings and produce. The effort Johnson has produced on the mound this spring has made him look like an All-SEC pitcher, not a freshman who has been on campus for six months. 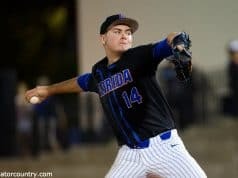 He has created a preseason buzz louder than the one before last season when freshmen pitchers Anthony DeSclafani (6-3, 4.98 ERA), Nick Maronde (3-1, 4.40 ERA) and Alex Panteliodis (6-5, 4.38 ERA) ended the year among Florida’s best pitchers. In seven innings of work this spring, Johnson hasn’t allowed a run, while striking out 12 batters. The key to Johnson’s performance on the mound has been learning how to pitch. Like most high school pitchers, the Cocoa Beach star sometimes just threw. He wouldn’t have a reason for throwing a pitch in a certain count, instead just trusting his ability to get hitters out. Even though those God-given abilities gave him 352 strikeouts in 252.2 career innings, he still didn’t have the knowledge on the mound needed to dominate at the college level. Tutoring from O’Sullivan has changed that. The Gator head coach and pitching coach branded on Johnson’s mind the importance of getting ahead in the count. If he throws first-pitch strikes and gets the leadoff hitter of every inning out, it keeps his pitch count down and makes it easier to pitch deep into games. The poise Johnson has shown on the mound has him right in the middle of Florida’s plans on the mound this season. 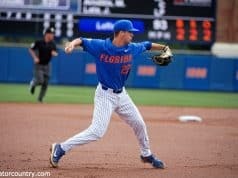 He hasn’t been afraid to attack the Gators’ best hitters, giving the Florida coaches the confidence that he will continue to attack against some of the best hitters in the SEC. The weekend pitching rotation won’t be announced until Monday, but when it is, don’t be surprised if Johnson is in it. The wildcard is that Johnson might get some time in the field too. He has swung the bat well enough to earn some playing time when not pitching, which might come at first base or as the designated hitter. 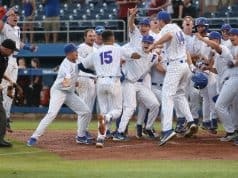 Conversations with the Florida coaches always remind him to keep swinging because the long season can take many twists, and a left-handed power bat is never a bad thing to have on the bench. The only concern is injury. It is widely agreed that Johnson’s future is on the mound. The risk of hurting himself while on the bases or hitting might not be worth letting him swing. Whenever he gets a hit during a scrimmage, Johnson is immediately pulled for a pinch runner to avoid the risk. The veterans on the team have taken notice. Johnson will be a key arm on the team this season, but he brings something else the older players aren’t so thankful for now. “About .100 less points in your (scrimmage) batting average,” Adams joked. They’ll be thankful when the season starts and other teams have to hit off Johnson.